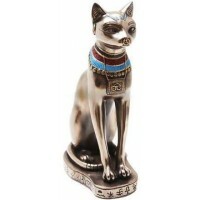 Beautifully hand finished, this statue of Bast, the Egyptian Cat Goddess, stands 29 inches high in gold and silver. 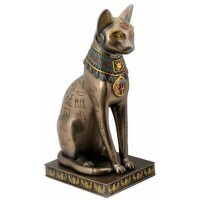 One of our largest statues of Bast, the Egyptian Cat Goddess, this piece is made of fiberglass reinforced resin and is hand finished in silver and gold. 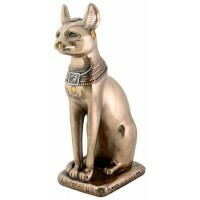 The ornate collar is intricately detailed. Stands 29 inches high. Item Number: AD-10132980 | Approximate Size (Inches): 11.00 wide x 18.00 deep x 29.00 high | Approximate Shipping Weight: 22.00 lbs. US Standard Shipping Ships directly from the manufacturer to you. Average transit time: 2-4 business days. International Delivery International Delivery is NOT available on this item. PO Box/APO/Military Delivery PO Box/Military address delivery is NOT available on this item.